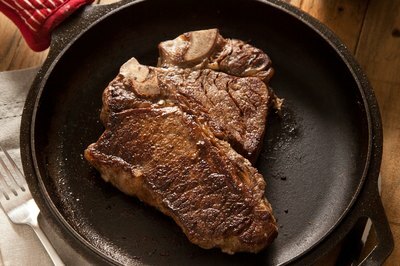 A T-bone cooked in a heavy skillet develops a savory, richly browned crust that's hard to match with any other cooking method, making this a technique any steak lover should master. 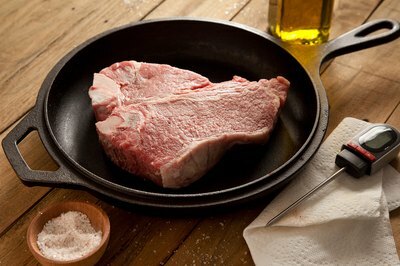 Season your steak with coarse kosher or sea salt at least 45 to 60 minutes before mealtime. This provides ample time for the meat's juices to dissolve the salt, and for the muscle to reabsorb the briny liquid. Turn your stove's burner to medium-high and place a heavy skillet over the flame or electric coil. Cast- iron is best because of its superlative heat retention. Heat the skillet until it shimmers and smokes slightly, and you can clearly smell hot metal. Pour a tablespoon or so of high-temperature oil such as grapeseed oil, safflower oil or avocado oil into the pan, and swirl it to coat the surface. 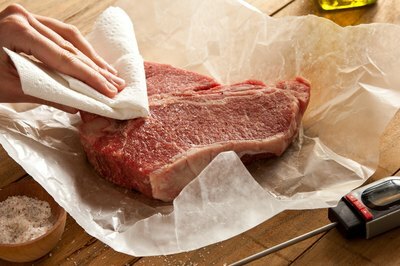 Blot the steak scrupulously with fresh paper towels to ensure that its surface is dry. 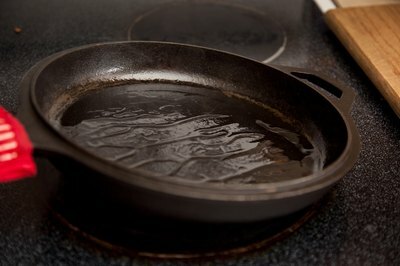 Gently lay a steak into the intensely hot pan, taking care not to drop it and splatter the oil. Sear it on the first side for 1 to 2 minutes, then turn it and sear the second side for an additional minute. Turn the burner down to medium heat. Slide the steak to one side of the pan, so its smaller tenderloin portion rides slightly up the sloped side of the skillet. The lean tenderloin cooks more quickly than the well-marbled striploin side of your T-bone, and using this technique to raise it slightly above the pan's surface helps equalize the cooking time. Cook the steak to your preferred doneness, turning it every 30 to 60 seconds. For a T-bone or porterhouse cut to a fairly typical 1 1/4 inch thickness, allow approximately 8 to 9 minutes for rare or up to 12 minutes for medium-rare. 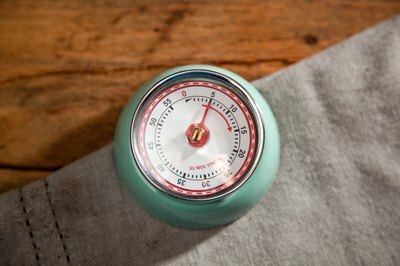 Test the steak's doneness by inserting an instant-read thermometer horizontally into the middle. A rare steak will read 120 to 125 degrees Fahrenheit, medium-rare 130 F, and so on. When the steak is done to your liking, remove it from the skillet and let it rest for approximately 5 minutes before serving. 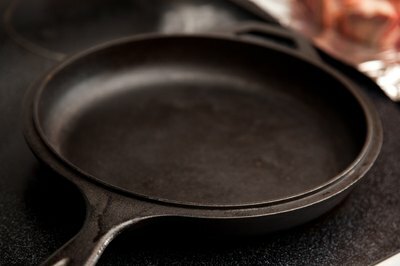 • If you don't have a cast-iron pan, an extra-heavy cast aluminum pan or a stainless-steel pan with a heavy copper or aluminum core makes an acceptable substitute. 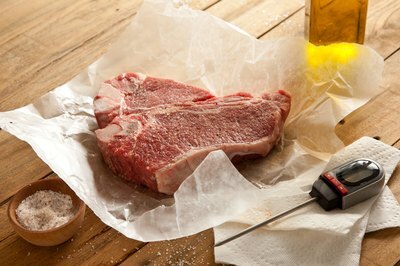 • Many home cooks and cookbook writers argue that steaks should only be turned once, on the not unreasonable ground that this is how it's done in top steakhouses. There are several reasons for steakhouses to work this way -- turning once preserves the pretty grill marks and simplifies the process of managing dozens of steaks simultaneously -- but frequent flipping is simply a better technique. Like rotisserie roasting, it provides better heat transfer and more-even cooking, resulting in a steak that's cooked all the way through without a burnt or overcooked outer layer. • Bone-in steaks such as T-bones are always slightly underdone or less-done near the bone. This is normal because the meat's proteins contract as it cooks and this shrinkage leaves the bone thicker than the steak itself. 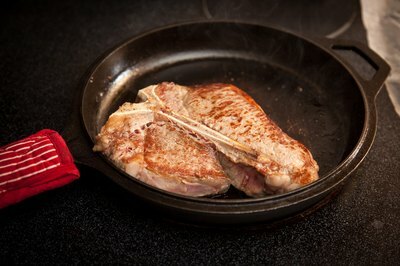 The area next to the bone is held slightly above the surface of the skillet, and consequently cooks more slowly. You can counter that by transferring the skillet to a preheated 400 F oven, finishing your T-bone in the gentler, diffused heat. This takes a few minutes longer, depending on the thickness of your steak, but reduces the risk of over-cooking. • An alternative method is basting your steak. Use an additional few tablespoons of oil in your skillet, then periodically tilt the pan and spoon the pooled oil over your steak near the bone. Baste the striploin side more frequently than the tenderloin side, otherwise you run the risk of overcooking the lean tenderloin. For additional richness and flavor, add a tablespoon of butter to the pan when your steak is nearly finished. 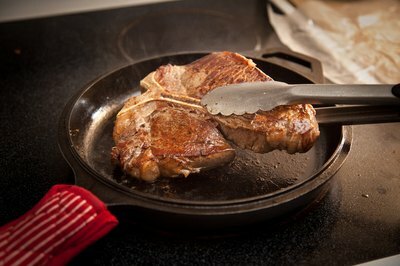 This also helps the T-bone develop a deeply browned surface.